For those who have been around here on Joyously Domestic for awhile, you may recall my Crispy Potato Roast back in December. I received a good deal of positive feedback on that post and I have made it for my family many times since originally adapting the recipe from Martha Stewart's website. With my husband gone for four days out of state for work and my son staying overnight at his cousin's house, it was just my two girls and I at home for the evening recently. We took the concept of my larger Crispy Potato Roast and downsized it to mini versions. We wanted to spruce it up, so we included ham and shredded Swiss cheese. This would be a great dish to make this week to use up leftover ham from Easter, as well. The key here is to slice the potatoes as thin as you can. I used a combination of gold potatoes and large, red potatoes because that is what I had on hand. Normally, I use regular russets when I've made the larger version in the past. 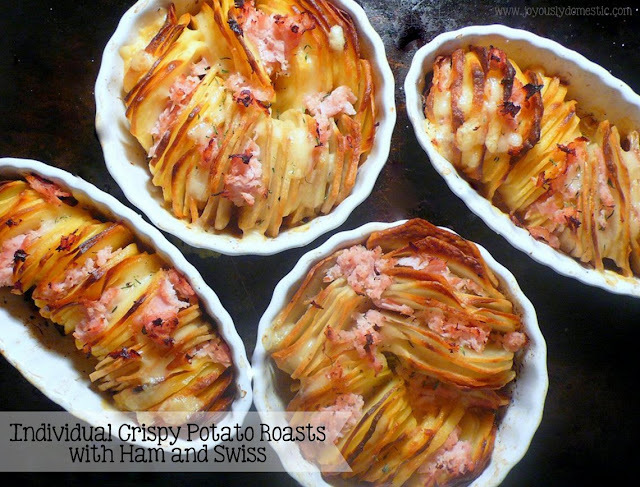 If you'd like to make this as one large dish, follow the method and cooking time listed within my Crispy Potato Roast post ... adding in ham and Swiss to the recipe. Combine the oil and melted butter in a small dish. Set aside. Brush four medium ramekins with a little of the butter and oil mixture. Slice the potatoes as thin as possible crosswise. Arrange potatoes vertically in the baking dishes. Brush with about half of the remaining butter and oil mixture. Sprinkle with salt (these need salted liberally) and pepper flakes (use some black pepper if not using red pepper flakes). Arrange ramekins on a large baking tray. Bake for 1 hour and 25 minutes uncovered. About ten minutes into baking, brush a little of the olive oil/butter mixture onto the slices, then do this a few more times during the rest of the baking process until all of the butter/olive oil mixture is used. Also, a butter knife can be used to separate some of the slices if there are some sticking together too much during baking. After 1 hour and 25 minutes, remove potatoes from oven. Add ham and Swiss by scattering on top of the potatoes slices and between them. Bake for an additional 35 minutes. Remove from oven. Top with thyme (optional). Snipped chives, also, are great as a garnish. Serve immediately. Sour cream is a great accompaniment to the potatoes.